Version 2.2.0 was a major revision to Splatoon, which came into effect on 20 October 2015. Battle Dojo Fixed the issue in which Splash Walls do not block opponents’ bombs and blasters. Splat Zones The leading team’s special gauge will gradually charge when the counter for both teams is stopped. The special gauge will charge faster when the counter is active. The special gauge will automatically charge gradually for the team that has control of the tower regardless of who has the lead. Decreased the speed at which the special gauge automatically increases. Changed the way in which the Splash Wall bounces when thrown against the top of the pillar of the tower in order to increase the difficulty to place Splash Walls on the tower while riding it. Walleye Warehouse: Adjustments will be made to prevent users from taking certain shortcuts in Rainmaker mode. Saltspray Rig: Adjustments will be made to prevent users from placing Splash Walls in certain places. Arowana Mall: Adjustments will be made to prevent users from taking certain shortcuts in all modes. Kelp Dome: Small adjustments will be made for Rainmaker mode. Flounder Heights: In addition to changing the stage layout in Rainmaker, other adjustments will be made to prevent users from taking certain shortcuts in all modes and to prevent the attachment of Suction Bombs in certain places. Hammerhead Bridge: Adjustments will be made to prevent users from taking certain shortcuts in all modes. Hero Roller Replica ▼ Adjusted the splash damage. Players can only splat their opponents in one hit with the center of the roller. ▼ Adjusted the splash damage. 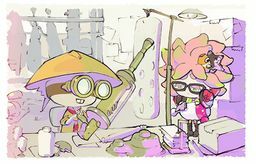 Players can only splat their opponents in one hit if they hit with the center of the roller. Custom E-liter 3K Scope ▼ The range of damage that can be done to opponents without fully charging the weapon has been adjusted to 40.0 – 100.0. It was previously 40.0 ‐ 120.0. Rank S+ teams will gain fewer points by winning, whereas S teams will gain more points by winning. The level of difficulty for maintaining the S+ rank with 99 points will remain about the same. The launching sound effect of the Inkzooka will be more audible. Fixed the issue in which the ink refills slightly when beginning to charge an empty Splatling weapon. Fixed the issue in which the Point Sensors and Disruptors do not function when there is significant lag in the connectivity. Fixed the issue in which players are able to move the Tower even when they are not on the Tower by swimming in the area bordering the top and sides of the Tower. Fixed the issue in which the Rainmaker shield does not take damage when the shield is extremely close to a wall. Fixed the issue in which visual effects do not display when some of the ink hit the Rainmaker Barrier and Splash Walls. Fixed the issue in which rollers occasionally inflict damage through thin walls. Fixed the issue in which Kraken occasionally inflicts damage against opponents hiding on the other side of a thin wall. Fixed the issue in which Shooter type main weapons shoot at a faster rate than usual when specific special weapons are activated. Fixed the issue in which the damage stats for Splattershot Jr., Custom Splattershot Jr., N-ZAP '85, and N-ZAP '89 are displayed as higher than they actually are. This only changes the information displayed in the stats. The actual stats will remain the same. This page was last edited on 15 December 2018, at 21:21.